What is an ‘index’ typewriter? The history of writing machines is so deeply dominated by one form of interaction (the keyboard) and one interface (the QWERTY layout) that the image of a typewriter evokes an everlasting ‘standard’ apparatus – parts of which continue to be reflected widely in present-day applications. 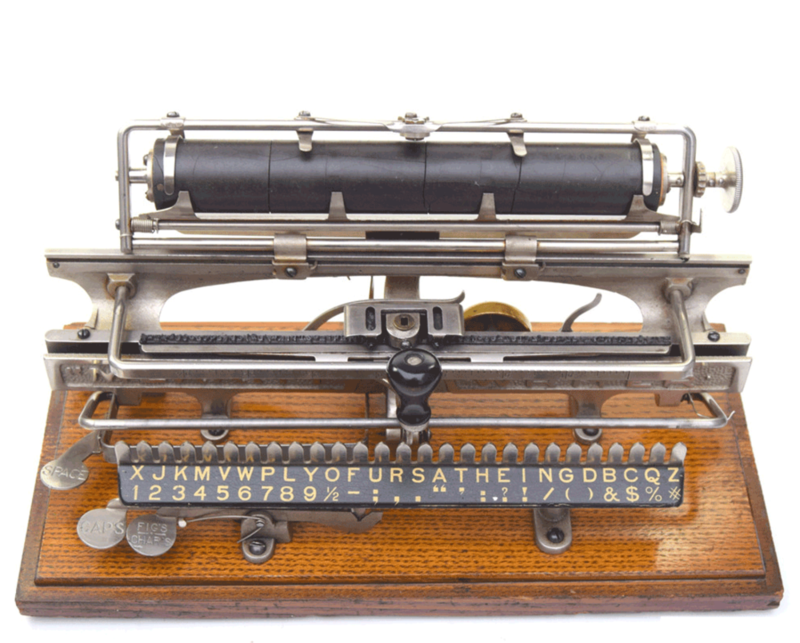 However, operative methods as well as alphabetic layouts of late-19th/early-20th century typewriters were as wide-ranging as they were fluid. They frequently involved unexpected approaches not only to the mechanics but also to ways of rearranging and accessing the alphabet. Drawing on a selection of non-keyboard ‘index’ typewriters, this exhibit explores the ways in which input mechanisms and alphabetic arrangements were devised and contested in the process of popularising typewrites: as personal objects, as affordable commodities, and as approachable new tools for writing. Through examples of original machines and related paraphernalia, the exhibit explores how letters of the Latin alphabet have been variously comprehended, accessed, and handled, before being impressed on paper. It reveals an exciting combination of mechanical ingenuity, conceptual reformulations, and commercial adventurism that made such variegated outcomes possible. As a set of imaginative responses to ‘mechanising’ the alphabet, index typewriters raise important questions in the key encounter – no pun intended – between writing and technology. Index typewriters are generally defined in opposition to keyboard-based typewriters. They are classified as machines that involve two steps in the process of inscribing a character on paper, as opposed to the more ‘direct’ keyboard action. 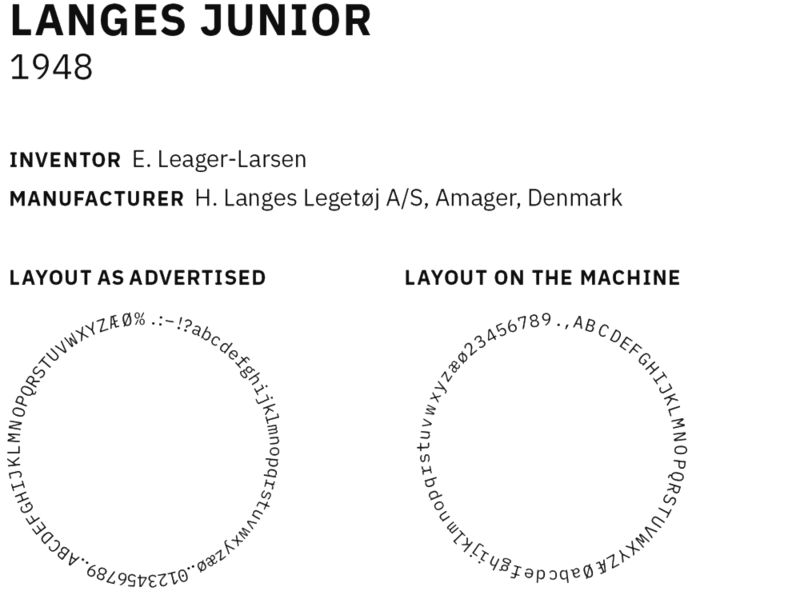 On index machines, the process of physically selecting the desired letter and then imprinting it on paper constitutes two separate processes, and usually two separate mechanisms. Contrary to appearances, index machines are not primitive versions of the ‘proper’ typewriter. Nor are they ‘stages’ in the development of keyboard-based typewriters. Most index typewriters appeared after, and were marketed concurrently with, keyboard-based typewriters. 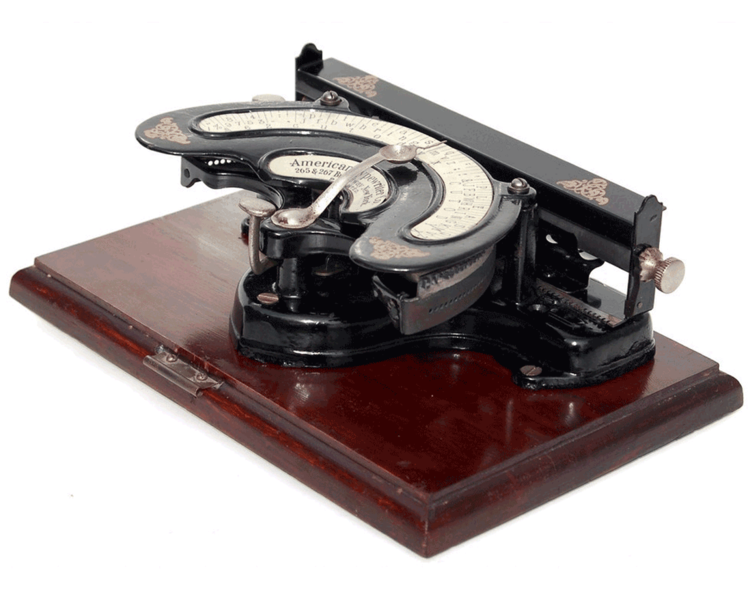 Most, if not all, of the earliest commercialised writing machines, such as the Malling-Hansen writing ball of 1865, in fact carried a form of ‘keyboard’. 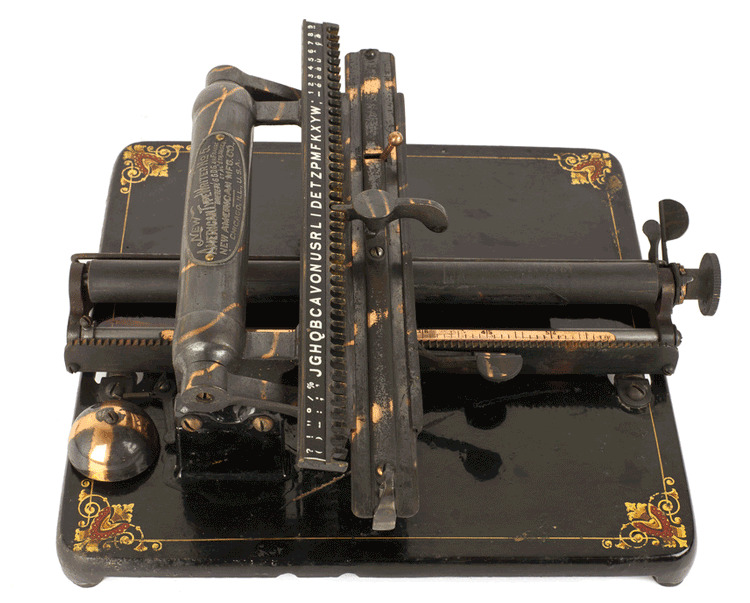 The very first commercial version of the Sholes-Glidden ‘type-writer’ in 1874 came with the QWERTY arrangement that is still familiar. The keyboard and its arrangement, thus, was challenged by index typewriters subsequently – as one of several possible approaches to ‘handling’ the alphabet. Keyboard-based machines, however, reified the connection between letters of the alphabet and ‘tangibility’, advocating a move – not only in conceptual terms but also literally – from sight to touch (as in ‘touch typing’). Photographs of index typewriters in use are rare: the above may have been part of a period reconstruction, specially made for an exhibition at the Henry Ford Museum (Dearborn, Michigan) in 1975/76. The original caption for this image read: Typists had no choice but to “hunt and peck” on equipment like this Odell Typewriter patented in 1890. The cumbersome process of selecting a letter with one hand and pressing type to paper with the other contrasts sharply to today’s streamlined office practices. Accessing characters on writing machines usually involved rearranging letters of the alphabet in particular configurations. 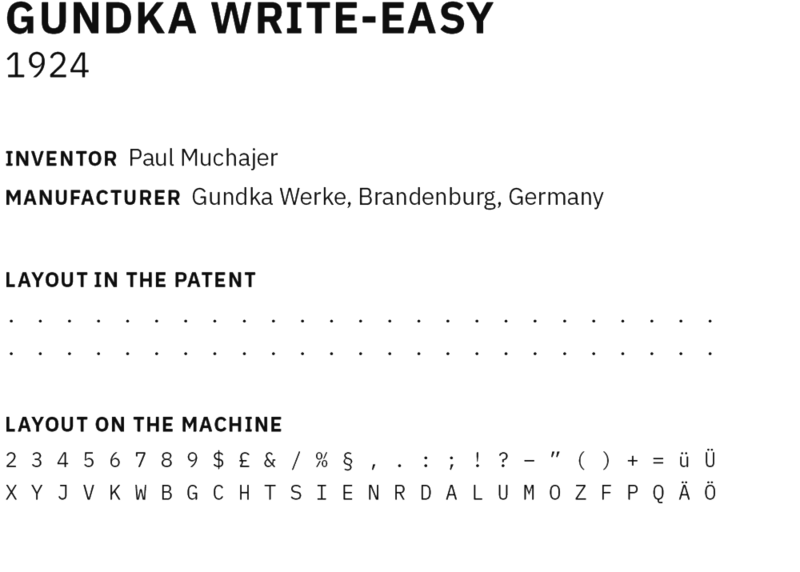 On keyboards, the configuration solidified as QWERTY (and its minor variants: QWERTZ, AZERTY, etc). 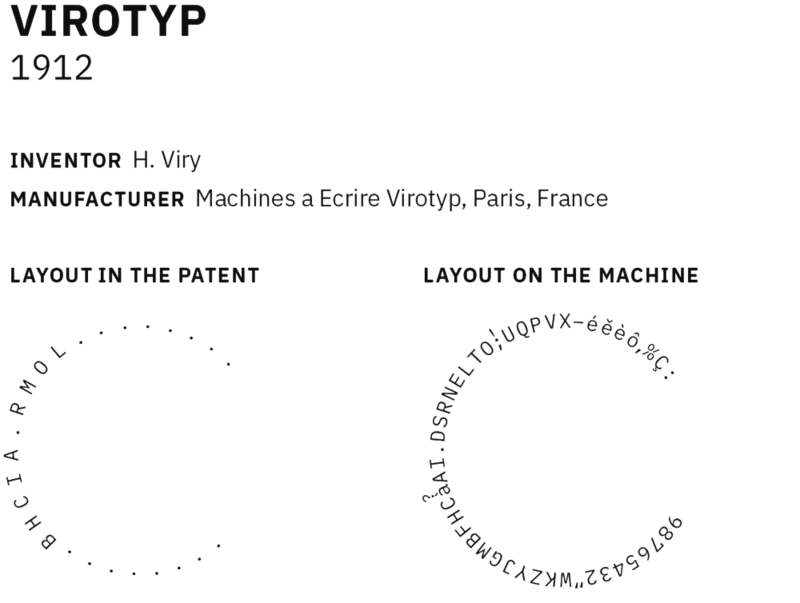 On index typewriters, however, the rearrangements were numerous, widely varying, and modelled with contextual specificity for different types of machines. 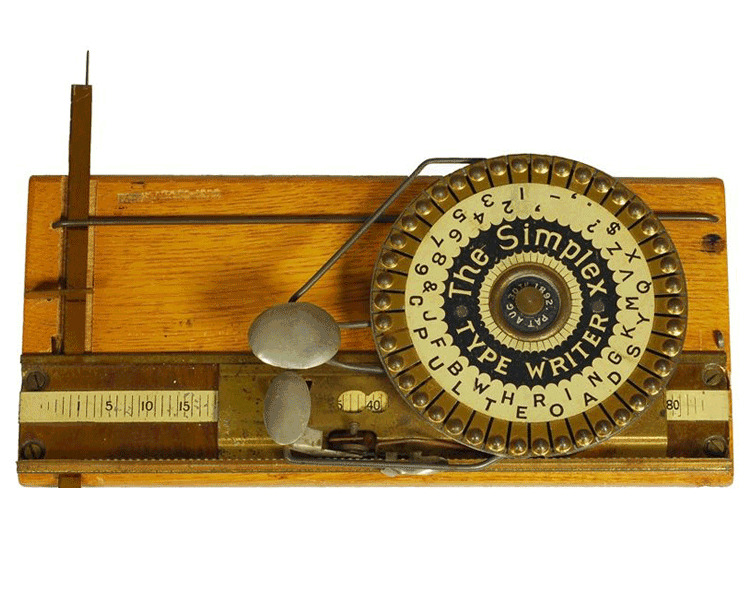 For example, typewriters with linear slots (see above: Merritt, Odell, etc) involved different considerations, and offered very different possibilities of layout than a machine with a dial mechanism (see below: Virotyp, Simplex, etc). 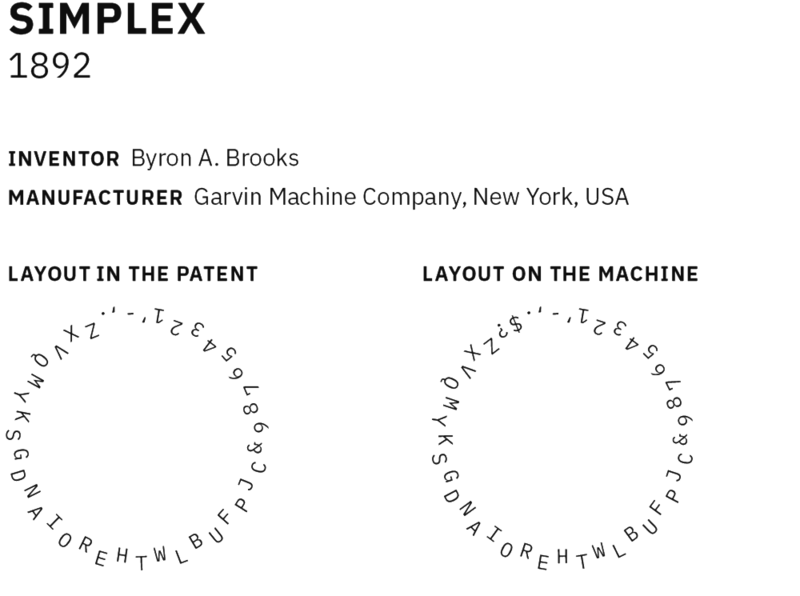 A stylus/pointer setup (see below: TipTip, based on Mignon, etc) conceptualised this arrangement as a grid, while concentric approaches (for example: Lambert, American, etc) combined with the shift mechanism created other, different, relationships. The arrangement of letters on a machine – simple though it may seem at first glance – was a critical function situated at an intersection of some complexity. It responded to a combination of factors such as the physicality of the human body (e.g. some actions could be performed more readily than others), the affordances of specific mechanical formulations (ease, economy, and speed of movement), the characteristics of language and script (e.g. some letters or letter-combinations occur more frequently than others), and factors related to marketability (such as machines for one-handed typing, or those aimed at novices or children). 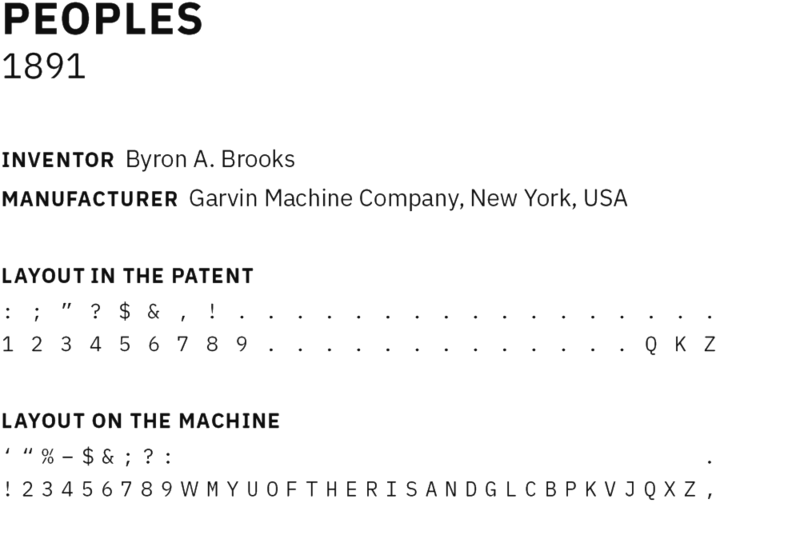 Index typewriters cost between one-fifth and one-tenth of the price of most ‘standard’ keyboard-based machines. They were cheap, portable, easy to use (or at least strongly advertised as such). They implied little or no investment in training and maintenance. Most importantly, index typewriters were personal commodities – to be used at home, at leisure, on-the-move, indoors or outdoors – in addition to their possible deployment towards more serious or conventional ends. For a broad non-professional public, they often served as entry points to the mechanical production of text. In contrast, keyboard-based typewriters were large, heavy, not easy to move around, required a much greater initial investment, and targeted offices and businesses as their primary market. 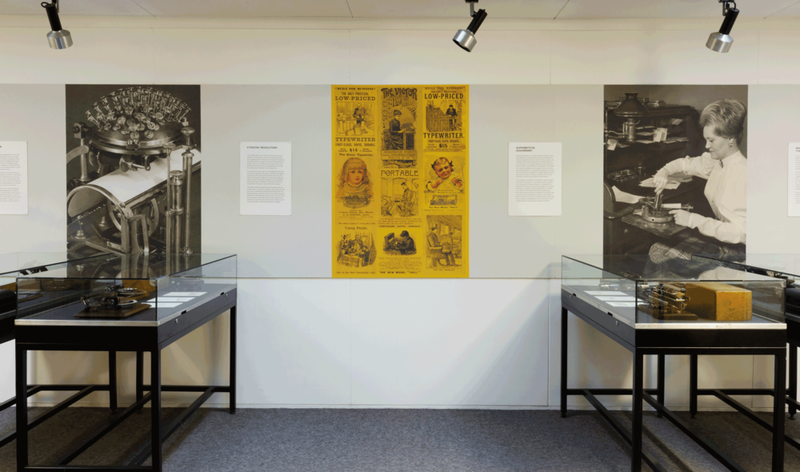 Their manufacturers envisaged trained personnel to operate the new machines – a category of labour that needed to be replaceable, thus requiring a greater stake in the idea of standardised apparatus and practices. At a critical historical moment, index typewriters played an important role in making new tools and technology for ‘writing’ approachable, new manuscript practices, new design considerations acceptable and popular. 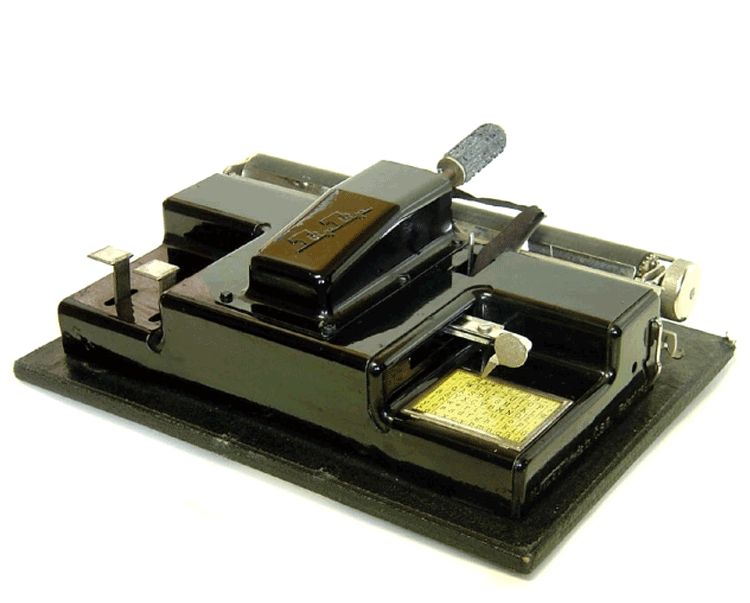 They also fed into expectations of portability, ease of use, special needs and contextual requirements – considerations that soon became significant for keyboard-based typewriters as well. Index machines have often been regarded as the ‘wild west’ of mechanical typewriters, implying that they were indeed at the frontiers of exploration (as well as exploitation of the market) but that they somehow transgressed the laws of the land – presumably ones set by the keyboard-based typewriter. Although the expression suggests an entirely American phenomenon, the ‘wildness’ also extended eastward – across the Atlantic, across continental Europe, and in a technical sense beyond the alphabet itself: to the logographic/ideographic writing systems of China and Japan. 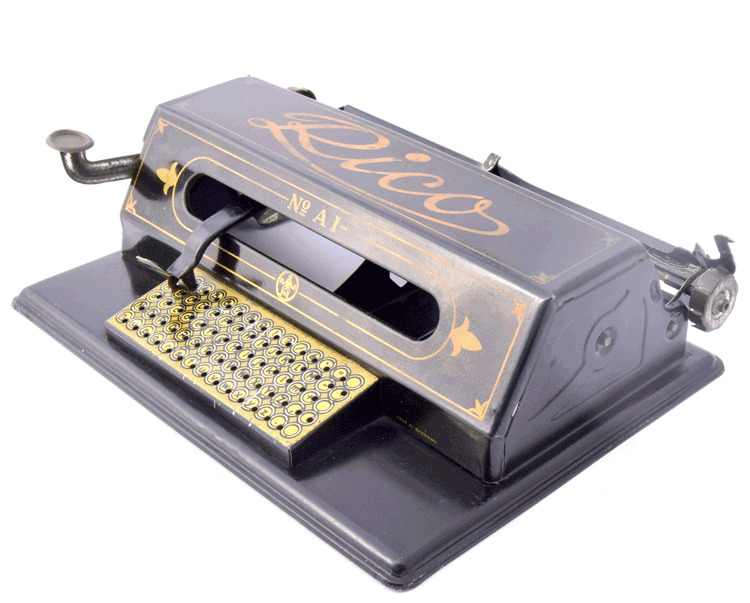 While the keyboard-based typewriter seemed to demand a measure of seriousness – a substantial investment, a dedicated space on the table, in an office, mediating official business – index typewriters promoted a brand of irreverence that not only made their use more intimate but also versatile. Their approach to innovation, as well as to marketing and publicity, appear to have been driven by a quest to situate writing using mechanical means as an everyday activity – and it soon extended to include writing in rather unusual circumstances. 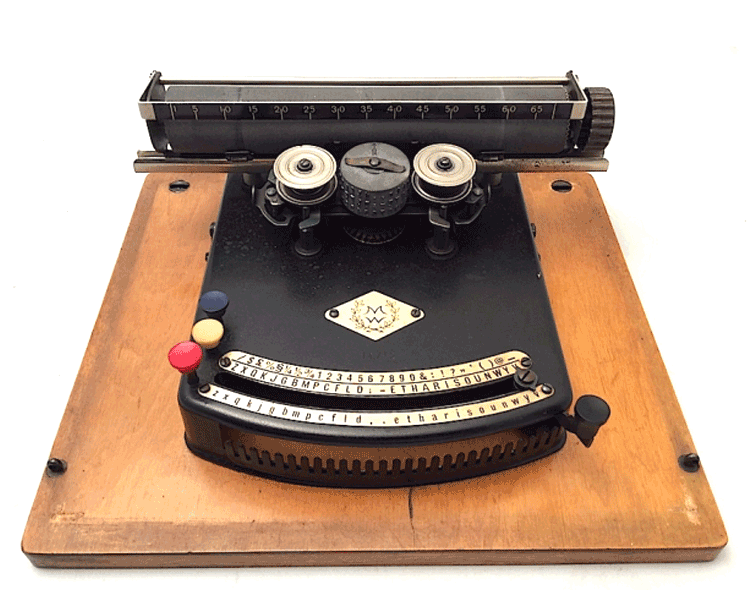 The Virotyp, for example, was a French product publicised around World War I as a portable typewriter for reporting directly from the battlefield, a machine that could be used on horseback, and – with no mean feat of dexterity – also with one hand while on horseback! Less daring machines proposed writing in train compartments, in parks, or in bed – they could be used by invalids, children, beginners, anyone, anywhere – without the fear of spilling ink, of course. It is useful to remember that typing – a process that seems entirely ‘natural’ to us today – was (and still is) a difficult skill to master. The general public had to be persuaded of its efficacy, and also needed to have access to some form of training. Considerable resources were put into this process of popular acceptance and skill-acquisition by typewriter manufacturers, pedagogical entrepreneurs, and commercial adventurists alike. The ‘self-instructor’ above was one of many cheap substitutes to enrolling in a typing school, and was aimed at beginners who could ‘wear’ it on their hands. Index typewriters were manufactured and sold in the tens of thousands. Ironically, their popularity was also part of the reason for their relatively short existence – the cycles of design, manufacture, commercialisation, relative success or failure in competition followed a veritably continuous process of experimentation and reinterpretation. Often versions of extant mechanical principles were made and carried forward in entirely new machines – those developed to address specific markets, and lower price points. Some of these machines were manufactured for only a few years, some remained popular over decades, right up to the mid-twentieth century. Because they were affordable personal machines, index typewriters had something of a didactic dimension from their inception. This role of teaching, or simply introducing mechanical means of writing to the uninitiated, became increasingly prominent mid-twentieth century onward. By that time, keyboard-based typewriters had established a stronghold in the market and a secure place in the popular imagination. 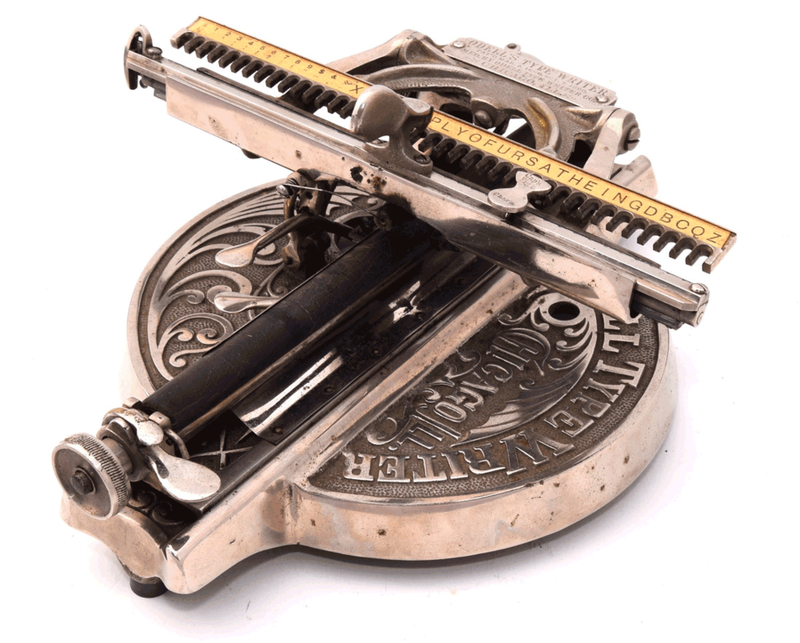 As toys, or mini-typewriters, index machines drastically reduced exploratory approaches. This can be observed particularly in the retention of the alphabetical order of arrangement – largely redefining the machines’ purpose to serve as an introduction to the alphabet for young learners. The interfaces that we use today for text input are directly related to the typewriter’s mechanism of depressing keys: keys originally made for fingers to move physical components and impress letters on paper. We still use the keyboard form, though, of course, this interaction does not have the same direct connection anymore to making letters on a screen appear. Our keyboards are simulations of the typewriter – both in terms of the interaction and the interface. It is particularly curious that we – including generations that never used a typewriter themselves – are tied to conceptions and practices that typewriters popularised. Not only in the somatic continuation of finger tips as the primary gateway to letters, but also in the spatial configuration of the alphabet in the form of a keyboard. This is particularly remarkable in a time when we increasingly use thumbs for text input on phones and tablets, instead of the full ten fingers, or indeed speech recognition for the same purpose. Historically, keyboard-based typewriters stipulated the use of both hands, if not all ten fingers for good practice. Index typewriters did not. In fact, several index machines experimented with one-handed operation, and some of them were aimed precisely at people with limited dexterity. Have we come full circle? Much of our typing on-the-go today is done using a single thumb, however, on a keyboard that is still the same interaction, still the same interface – demanding two hands, ten fingers. Challenges to the keyboard have had a long history, and both its mechanism and its arrangement continue to be challenged. Several possible substitutes and alternatives have been developed in recent years. The Tap Strap, a ‘wearable keyboard’, eliminates the visual and material ‘keys’. Instead it assigns combinations of fingers as a code for letters of the alphabet, which can be accessed by tapping on any surface. It is interesting to note references to the direction set by the keyboard: the move from sight to touch, the connection between characters and tangibility, a reconfiguration of the alphabetic interface, and the continued ‘digital’ interaction. How and why do ideas of order and layout, frequency and placement, efficiency and speed, sufficiency and economy, connect to the letters of the alphabet? Or do they connect rather to the interactions and interfaces that mediate text-input? In other words, was the keyboard ever ‘inevitable’? An assortment of discrete ‘keys’ tied to distinct functions was well-established as a way of operating or interacting with mechanical devices, long before typewriters. 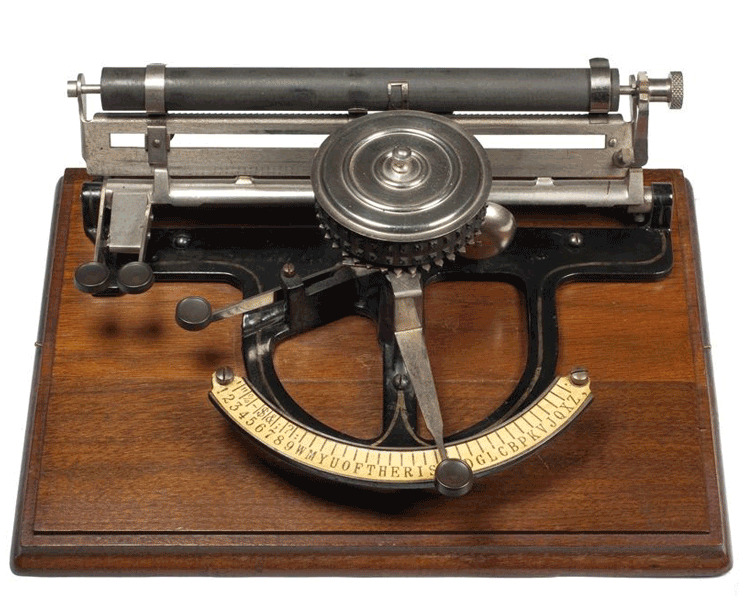 Certain musical instruments come to mind most readily, but so does telegraphic equipment – their interconnections rarely acknowledged in the historical development of typewriters. Isn’t it endlessly fascinating that musical ‘keyboards’ and text-input should become so deeply, inextricably, linked in the alphabetical, mechanical, and popular imagination? What did keyboards offer that other forms of text-input did not? Was the keyboard simply a response to the demands of the alphabet? Or are interactions and interfaces related to text-input themselves instrumental in shaping our understanding and deployment of the alphabet? These questions situate index typewriters as critical junctures in an ongoing process of reconfiguration, and technological negotiations, rather than as quaint historical curiosities.